The view from my seats at the Halsey concert at PPG Paints Arena. Halsey has been known to put on visually stunning concerts. I witnessed this first hand when my best friend and I went to see her on the Badlands Tour at Stage AE last August. When she announced the Hopeless Fountain Kingdom Tour (in support of her album of the same name) earlier this year, we knew we were definitely going to see her again in Pittsburgh on Oct. 10. This time she was playing at PPG Paints Arena instead of Stage AE. This was also the first time she headlined the arena, only coming here as an opening act for Imagine Dragons in 2015. The stage set-up was curtained off to keep it a surprise until she went on. The arena was split into the two houses, House of Angelus and House of Aureum, from the Hopeless Fountain Kingdom. The VIPs for the show got to stand on platforms that were a part of each side of the stage. There was also a walkway that went up the middle of the floor and ended at a smaller stage in the back of the arena. The show started off with the first of two opening acts, Charli XCX. During the final song, she walked through the crowd by way of the walkway and even went up into the lower level seats above the floor. Overall, Charli was a great start to the show. I knew most of the songs on her set list, so it wasn’t hard getting excited for her performance. The final opening act was Partynextdoor. I honestly had never heard of him before, so I wasn’t familiar with his set list. The only song I knew of his was his recent release “Damage” featuring Halsey, which he didn’t perform. He wasn’t too bad, but the bass made it hard to hear the actual music and what he was singing. After a brief intermission, Halsey’s set began with the opening track “The Prologue.” Then the beginning of “Eyes Closed” played and Halsey’s silhouette appeared behind the curtain, much to the delight of the crowd. 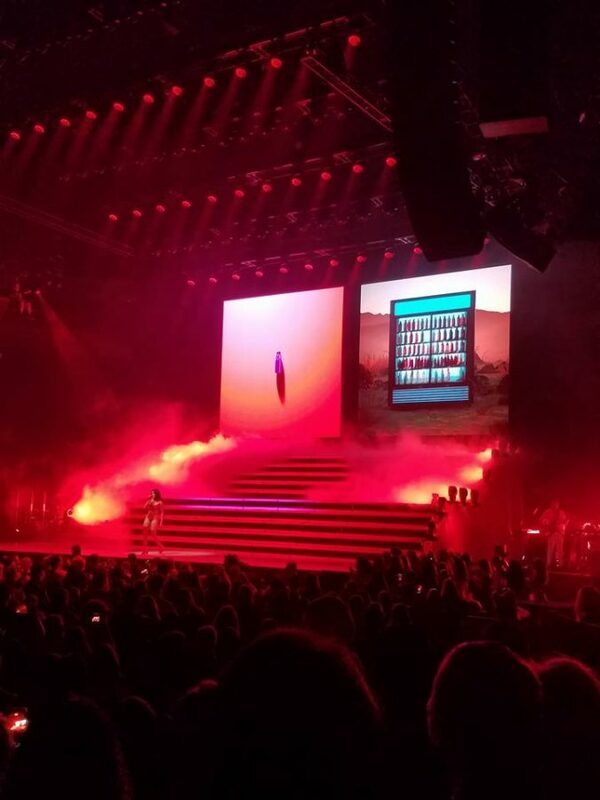 Right before the chorus started, the curtain dropped to reveal Halsey as well as a stage that included two giant screens and three sets of steps. It became quickly apparent that the visuals for the show was going to be unlike anything we had ever seen. The next two songs she sang, “Hold Me Down” and “Castle” came from her previous album, Badlands. Then came “Good Mourning,” “Heaven in Hiding” and “Strangers.” I couldn’t help but be mesmerized by the visuals that appeared on the screens and steps, as well as the choreography between Halsey and her dancer. Before “Alone,” Halsey talked about how she opened the tour on her 23rd birthday and decided that every show was going to be her birthday as well. Towards the end of the song, red, orange and yellow butterfly-shaped confetti fell from the rafters, which we were able to catch. She then left the stage for a wardrobe change, while a member of her band played piano. She returned and performed a stripped version of “Closer,” her hit single with The Chainsmokers. That was followed up by the ballad “Sorry,” which she delivered with heart-wrenching emotion. The next song was “Angel on Fire,” and the stage brought it to life. Every time the chorus started, fire sprang up from the steps on the stage in perfect sync with the lyrics, “And I’m faded away, you know I used to be on fire”. Right after, Halsey ran down the walkway to the smaller stage in the back. There she played “Lie” and “Don’t Play,” alongside her dancer. She made her way back to the main stage and explained that she wanted to have an aspect that made each show unique. This was giving the VIPs the option of voting on a song to be played during the set list. The choices they had were “100 Letters,” “Ghost” and “Drive,” with “100 Letters” being the winner. After the VIP song, Halsey told the crowd a story about the last time she was at PPG Paints Arena. She was nervous about whether people would like her or not. As she was performing “Hurricane,” her wig fell off. She was horrified but decided to show off her natural hair. She described going backstage and crying, thinking that no one would like her after that. But she said the bright side in all of it was that “short-haired Halsey” was born that night, and if that hadn’t have happened maybe some of her fans wouldn’t have been comfortable having short hair as well. She ended her speech by saying the next song was a very special song to her and her fans, “Is There Somewhere.” Before the chorus hit, Halsey got down into the crowd to hug and take pictures with fans. At one point she was even four rows away from where we were sitting. Halsey disappeared after the final song, but “Hopeless” began to play. The screens projected videos of her performing and interacting with fans over the years. The arena screens showed people in the crowd singing along. Towards the end of “Hurricane,” she told the crowd that the song was a reminder that they didn’t belong to anyone but themselves. After that, white confetti fell from the rafters as the show came to an end. Overall, I was blown away by Halsey’s show. I knew it was going to be great, but it far exceeded my expectations. It was such a cool feeling hearing the entire crowd sing along with her the whole night, not once letting up. Everything was perfect, with the visuals and energy being spot on. If you have never experienced a Halsey concert, I suggest you do. Not only are her live vocals exactly like her studio recordings, but she puts a lot of detail into what you see and not just hear. I look forward to being transported into Halsey’s world again soon. Her live vocals are exactly like her recording because she lipsyncs. It was obvious at the concert I saw her at.